Have your children put everything they carry in a backpack or school bag so that they won’t drop things along the way. Encourage them to wear bright, contrasting colors so they will be more easily seen by drivers. Make sure children leave home on time so they can arrive at the bus stop before it is due, ideally at least five minutes early. Running after or in front of a bus is dangerous. Walk young children to the bus stop or encourage children to walk in groups. There is safety in numbers; groups are easier for drivers to see. Practice good pedestrian behavior: walk on the sidewalk, and if there is no sidewalk stay out of the street. If you must walk in the street, walk single file, face traffic and stay as close to the edge of the road as you can. Stop and look left, right and then left again if you must cross the street. Do the same thing at driveways and alleys. Exaggerate your head turns and narrate your actions so your child knows you are looking left, right and left. Have children wait in a location where the driver can see them while driving down the street. Try to avoid waiting in a house or car. Do not let children play in the street. Playing with balls or other toys that could roll into the street is also dangerous. Warn children that if they drop something getting on and off the bus, they should never pick it up. Instead, they should tell the driver and follow the driver’s instructions. 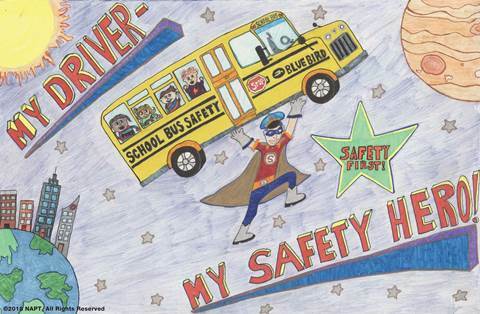 Remind children to look to the right before they step off the bus. If you meet your child at the bus stop after school, wait on the side where the child will be dropped off, not across the street. Children can be so excited to see you after school that they dash across the street and forget the safety rules. They are in backpacks or other holders, keeping hands free to use handrails while boarding and departing the bus. The sound is muted or headphones, earbuds or similar devices are used. Content does not violate the law or school district policy and procedures. Use does not create a distraction for the driver. As part of National School Bus Safety Week, Texas state troopers will ride in or follow some school buses this week in an effort to make sure other drivers are obeying traffic laws related to transporting students. More than 43,000 buses transport about 1.6-million children to school each day across the state.